Chickenpox is a common viral infection of childhood. After an incubation period of 10 to 21 days, a child will break out with a rash which begins as small red bumps and which very quickly form clear blisters. The clear blisters then rupture and form dark crusts. These three lesions occur in sequence. Lesions generally begin on the chest or back and then spread to the face, neck, arms, and legs. 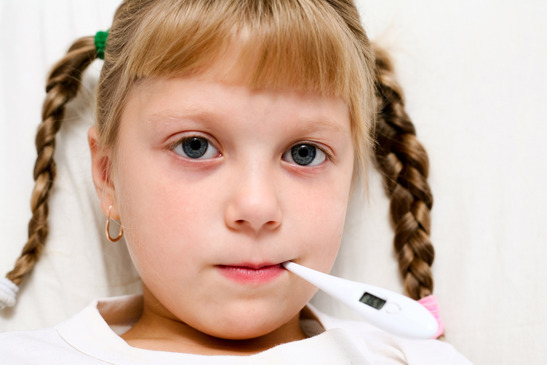 Children usually run fever for several days. In addition to this, they may have a runny nose, sore throat and/or cough. Chickenpox is highly contagious. The child is contagious one day to two days prior to breaking out with the rash and remains contagious until all lesions have completely crusted over and there are no blisters or fever. This generally takes five to seven days from the onset of the rash. You can usually expect the child will break out with new lesions for two or three days after the first lesion is seen. Chickenpox is generally a mild illness with no complications. If complications do occur, the most common one is secondary bacterial infection of the lesions manifested by redness and/or discharge of pus. You treat these as you would treat impetigo (see section on impetigo). Serious chickenpox complications are very rare. These involve pneumonia and encephalitis. Signs of encephalitis include headache, stiff neck, vomiting and lethargy (drowsiness to unconsciousness). If your child should become lethargic and begin vomiting, contact your doctor right away. Shingles is a reactivation of chickenpox infection and is usually seen in adults. People with active shingles are contagious and can spread the chickenpox virus to others who have not had chickenpox. You can catch chickenpox from someone with shingles, but you cannot catch shingles from someone else. Shingles only occurs in someone who has had chickenpox at an earlier time in their life. Parents and grandparents do not need to worry about catching shingles from their children with chickenpox. Shingles is treated the same as chickenpox unless the child develops painful shingles which should prompt a physician contact. Shingles is spread by direct contact with the lesions. Keeping them covered with clothing or a gauze pad will help to prevent spread of the disease. Keep your child away from other children or adults who haven’t had chickenpox and from pregnant patients or patients receiving chemotherapy. Although chickenpox is usually a mild illness in children, it can be quite severe in adults. If you are unsure as to whether you have had chickenpox and your child catches the disease or has been exposed to someone with the disease, you need to let your physician know. Use an antihistamine such as Benadryl for itching and trim the child’s fingernails. If itching is quite severe, even with Benadryl, try Aveeno baths and an emollient lotion (Do not use Benadryl Cream). For fever and the discomfort of chickenpox you may use acetaminophen (Tempra, Tylenol; see Dosing Guide) if your child is uncomfortable. Aspirin should be avoided because of the potential for Reye’s syndrome. Fever is actually beneficial in chickenpox and should not be treated if your child is comfortable. The child is contagious for about a week after the onset of the rash or until all sores have crusted over and have begun to dry. It is not recommended that you expose your child to chickenpox in order to get the disease. It is not recommended that aspirin be routinely used for chicken pox or fever in children. Varivax (live attenuated chickenpox vaccine) is now available and recommended for all children 12 months or older who have not yet had chickenpox. More details about this immunization are presented in the immunization section of this handbook. Your child’s physician can also discuss Varivax with you.